Do you miss the classic iPod feature, "shuffle by album"? This simple app brings it to iOS. It supports iPod Touch, iPhone, and iPad devices. Now you can listen to your music library on shuffle, without mixing up the tracks inside a live concert, classical recording, or concept album. 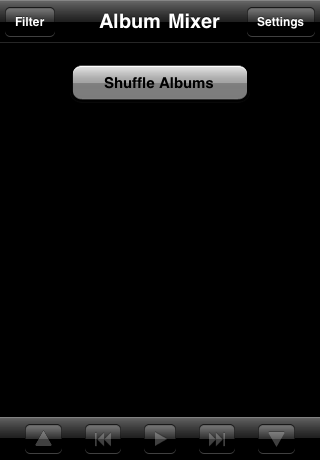 Simply tap the button marked "Shuffle Albums". 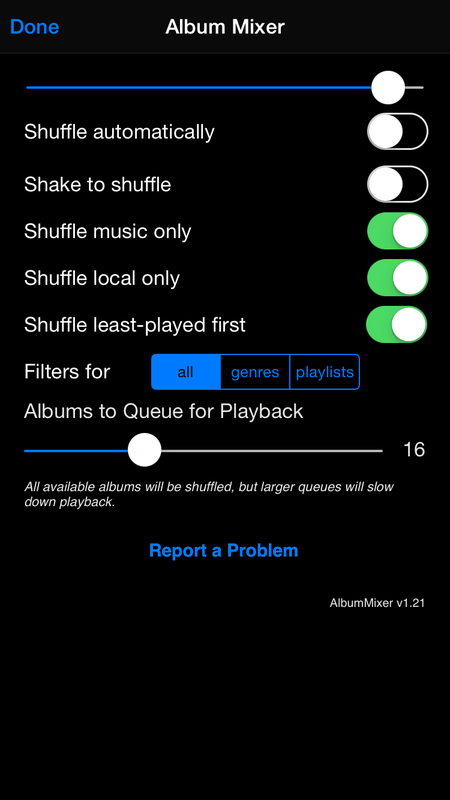 AlbumMixer will shuffle all your albums, then add the first 12 to the built-in iPod music player and start playing. You can close the app now: the music will keep going. If the album now playing has album art, AlbumMixer will display it. Otherwise you will see the album title and artist. You can use the bottom toolbar to pause, skip to the next track, or skip to the next album. You can also rewind to the previous track or album. AlbumMixer uses the builtin music player, so all the normal volume and playback controls still work. 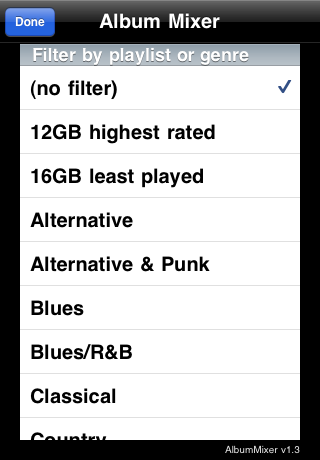 In filters you can select a playlist or a genre from which to shuffle. By default AlbumMixer shuffles all albums. Shuffle automatically when the app launches. Shuffle when the device is shaken. Limit shuffle to music tracks, ignoring other track types. 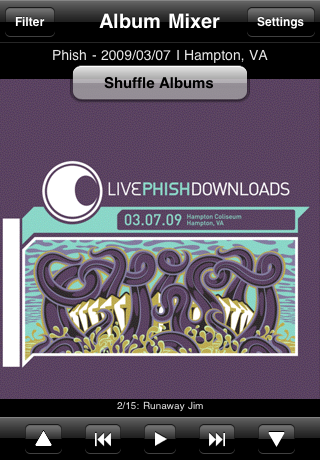 Limit shuffle to local tracks, ignoring iTunes Match. Display all filters, genres only, or playlists only. Set the number of albums to queue. AlbumMixer always shuffles all albums, but queuing the selected tracks can be slow. This setting helps limit that. Report a problem to the developer, via email. Don't like what's playing? Press the "Shuffle Albums" button again. Compatible with iPhone, iPod touch, and iPad. AlbumMixer requires iOS 6 or later. Releases may also be available for earlier versions of iOS. Please report problems via the "Report a Problem" link on the Settings page. If you can't use that feature, please use email.